AAC Swim Team has the BEST parent involvement around! The meets couldn’t be run without the help of these dedicated people. We all rely on one another to make our swimming summer the best it can be for swimmers and families. 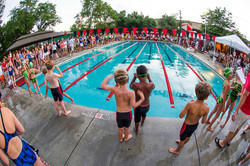 Swim meets provide numerous opportunities for volunteering. Many of these areas will be communicated via our weekly email link, but you are also welcome to take one on for the season! If you are interested in heading one of these areas up, please contact one of the swim team committee members! Check back as the season approaches for individual links to volunteer at each meet, as well as for donut Fridays! Set-up - If you like to arrive early to get a close parking place and you have a strong back, this job is for you. It includes setting up the tent, the heating area, the work area, and generally getting the pool ready for the meet. Timer Coordinator - This individual is responsible for signing up AAC timers for both home and away meets. Although much of the sign up will take place prior to the meet, this individual will be responsible for finding volunteers to fill any gaps. If you are interested in meeting many of the AAC parents and are available at the begining of each meet, this job is for you! Announcer Coordinator - AAC is league renowned for announcing at meets. We need someone to coordinate the 1-2 other announcers that will announce only at home meets. You will be responsible for building this team of like minded individuals who want to communicate information to the public and bring color to the meet! Timer/ Card Runner - Get a front row seat to all of the action and work on your tan! Sign up in advance of each meet or on the day of. Shifts are typically broken into 3 different short time periods and the job is easy! Please see the Timer Tip sheet. Time Card Highlighting - If you enjoy working with numbers, volunteer for time card highlighting. You review each swimmer’s race time and highlight their winning time. Training provided and you are in the shade with a great view of the pool! Heating - If you enjoy being around kids, this is the place to be. This job involves putting the swimmers in the appropriate heats and lane assignments. Ribbons - Do you like to sit down in the shade? We need your help preparing ribbons! It’s easy and it’s fun. Hostess - The hostess delivers refreshments to the parent volunteers and coaches during the swim meet. This is another important, easy, and fun job. Applewood Relays - This is a really fun meet! Volunteer in any one of the above areas for Applewood Relays! We also need help selling and serving food from the snack area to the many hungry people who attend. League Food Coordinator - This individual will work with the team coordinating the League meet to arrange for food during League. In addition to the items below that take place during swim meets, we need individuals to take on the following responsibilities. Depending on the position, these volunteer activities can involve building a team of volunteers or working on responsibilities outside of the normal meet dates. Please review these functions and find a swim committee member if you want to take on one of these functions. Volunteer Coordinator - This individual is responsible for coordinating volunteers for all swim team events. Awards Coordinator - This individual is responsible for designing and coordinating the purchase of awards for special meets and end of year swimmer awards. Spaghetti Dinner - We're looking for someone to take on the coordination of our annual spaghetti dinner. We have great files and plans in place and just need someone to take over coordination. Applewood Relays Concessions - We need someone to spearhead the concessions for the Applewood Relays meet. This involved coordinating the purchase of the food and coordinating volunteers for the day of the meet.